Representative Honours: Northern Ireland: 95 Full Caps / 36 goals (2000-2013), 1 ‘B’ Cap (1999), 8 Under-21 Caps / 4 Goals (1998-1999), 5 Under-18 Caps / 2 Goals, 2 Under-16 Caps / 1 Goals; 10 Schoolboy Caps (1995). Awards: BBC NI Sports Personality of the Year 2005, 2007; NI International Personality of the Year 2000, 2005, 2007, 2008; UEFA Team of the Year Nominee 2007; MBE 2008; NIFWA Hall of Fame Inductee 2014. 17-11-1998 made Under-21 debut, coming off the bench to equalise in a 1-1 draw with Moldova. 09-02-1999 made his ‘B’ international debut in a 1-0 defeat by Wales. 17-08-1999 came off the bench to score twice for the Under-21s as they defeated a star-studded French team 3-1. 08-10-1999 won his eighth and final Under-21 Cap. Scored a record equal total of four goals. 23-02-2000 made his Full international debut, scoring twice in a 3-1 win over Luxembourg. 07-10-2000 scored his fifth international goal in his sixth appearance. A forty yard screamer against former Manchester United teammate Peter Schmeichel in a 1-1 draw with Denmark. 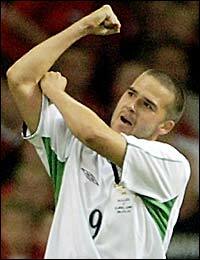 18-02-2004 broke Northern Ireland’s 1298 minute goal drought in a 4-1 defeat by Norway. 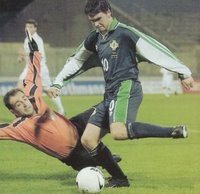 31-03-2004 became just the twelfth Northern Ireland international to reach double goalscoring figures as he scored the winner in a 1-0 victory over Estonia. Northern Ireland’s first win in sixteen games. 06-06-2004 scored his thirteenth and fourteenth international goals to equal and then surpass the Northern Ireland goalscoring record in a 3-0 defeat of Trinidad & Tobago. Also became the first player to score in three consecutive games for Northern Ireland since Willie Irvine (1965-66). 08-09-2004 scored in a 2-2 World Cup Qualifier against Wales in Cardiff. Sent-off after the referee took exception to his celebrations. Consequently, missed the next international through suspension, bringing to an end a run of 38 consecutive international appearances. 07-09-2005 scored the only goal against England in a 1-0 World Cup Qualifier victory at Windsor Park. The first Northern Ireland goal against England since Terry Cochrane’s (another Killyleagh man) goal at Wembley in 1980. First win over England since 1972, and first win in Belfast over England since 1927. 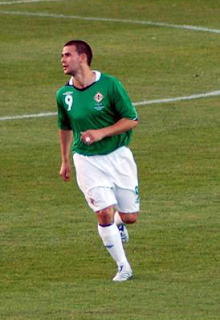 16-08-2006 won his fiftieth Northern Ireland cap, and captained the team for the first time against Finland. Celebrated the occasion by scoring his twentieth international goal. 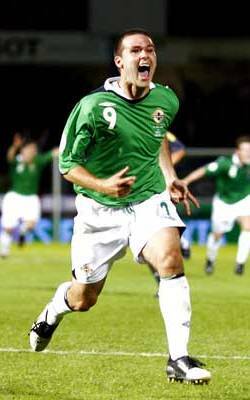 06-09-2006 became the first Northern Ireland player to score a hattrick since Colin Clarke in 1991, and the first at Windsor Park since George Best in 1971, as Spain were defeated 3-2. This was also the first time Northern Ireland had scored against the Spanish, never mind defeated them, at Windsor Park, and their first victory over them since the 1982 World Cup Finals. 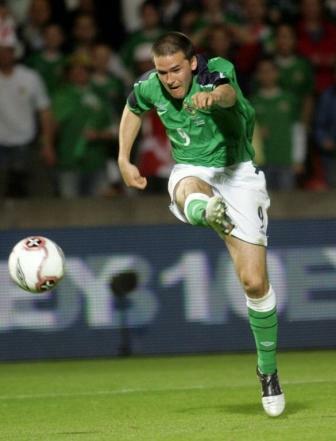 24-03-2007 takes his goal tally to 27 with a hattrick in a 4-1 win in Liechtenstein - the first ever Northern Ireland international to score two seperate hattricks. 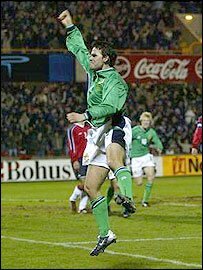 28-03-2007 scores twice as Northern Ireland defeat Sweden 2-1 to top their European Championship quailification group. 22-08-2007 marks Nigel Worthington's first game as amanger with two goals against Liechtenstein, marking a run of four conecutive games in which he scored (eight in total), a feat only achieved by four other players (Jimmy Dunne, Willie Irvine and Sammy Wilson). 17-11-2007 scores the winner against Denmark, his thirteenth in the Euro 2008 qualifying series which is a new tournament record. 13-06-2008 awarded an MBE in the Queen's Birthday Honours List for services to football and to the community in Northern Ireland (STORY). 14-11-2009 was "dropped" to the bench for Northern Ireland's match against Serbia after a run of nine international matches without a goal. 08-11-2010 "dropped" from the Northern Ireland squad for the forthcoming friendly against Morocco. 30-01-2011 joins child-hood favourites Rangers who take over his Sunderland contract and he makes his debut against Motherwell on 12-02-2011. 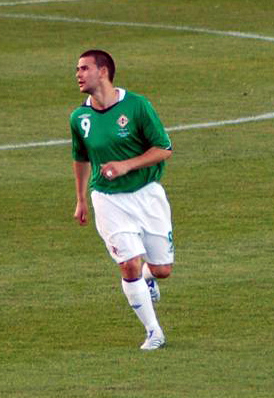 11-10-2011 equals Mal Donaghy's out-field record of 91 Northern Ireland caps when leading the attack against Italy. 25-08-2012 once again scores on his debut, this time a penalty for Bury against Coventry. 02-12-2013 announces his retirement from playing. 14-10-2015 having been involved in coaching Northern Ireland's youth teams since his retirement, Healy is appointed manager at Linfield, succeeding ex-international strike-partner Warren Feeney. 06-05-2017 rounds out his first full season as Linfield manager with an Irish Cup final win over Coleraine to add to their first Irish League title in five years along with a Co Antrim Shield success. Summary: 83(12)/36. Won 25, Drew 23, Lost 47.